about the January 1 killings in Benue State. 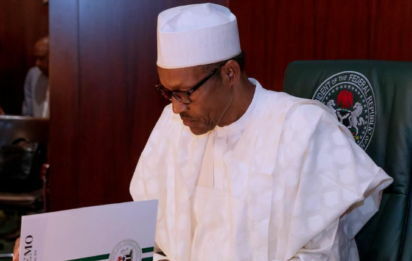 President Buhari, in a letter to the Senate, said that it was incorrect to infer that nothing had been done, especially when the police were strenuously working to apprehend the killers. The President’s letter was in response to the Senate’s which detailed its resolutions on the killings and the way out of the development. The presidential letter dated 25 January, 2018 and addressed to the Senate President Bukola Saraki is titled “Re: Report on the review of security infrastructure of Nigeria on the emergency visit to Benue State”. The letter was read to senators by Saraki yesterday. Herdsmen suspected to be Fulani had, on January 1, swooped on two communities in Benue State, Guma and Logo, killing over 73 residents. Many others were injured. The President said that on January 9, at a session with Benue State Governor Samuel Ortom, the governor was informed of police arrest of some suspects. He noted that the governor was told that the police had been instructed to speed up the trial of the suspects and give wide publicity to their (the police) efforts. “To infer therefore that nothing has been done is incorrect. The police are strenuously working to apprehend the rest of the culprits of these heartless killings,” Buhari said. He told the Senate that the Federal Government was initiating measures to address the Benue killings and other security challenges to alleviate the consequence of the attacks and forestall reoccurrence. He said that the Senate resolution itemised in the letter to him, would be considered and “I’m instructing all relevant Ministries Departments Agencies (MDAs) to factor them in their work”. As part of measures to address the security situation, President Buhari said that on December 19, 2017, while receiving the report of the committee that was set up to review the technical and administrative structure of the Nigeria Intelligence Agency (NIA), he underscored the need to review the entire national security architecture. The President said that the measure was in line with his promise in his inaugural address on the 29th May, 2015. He said action was being initiated to receive maximum cooperation from the Senate in line with paragraph three of the Senate resolutions which sought collaboration in addressing security challenges. The letter reads: “I thank you for your letter referenced NASS/8S/R/01/33 dated 18th January 2018 and carefully studied the resolutions and comments there in. “As I briefed you and the RT. Hon. Speaker when we met, several courses of action have been taken prior to the Senate resolution. “One, on Thursday 4th January, I sent the Minister of Interior and the Deputy Inspector-General of Police in charge of Operations for an on-the-spot assessment of the situation. “Three, on Monday 8th, the Minister of Interior met with the following: Governors of Adamawa, Kaduna, Niger, Benue Taraba and Nasarawa together with the DG of the State Security Services, Inspector-General of Police, CG Civil Defence, Minister of Agriculture and Rural Development and Police Commissioner of the six aforementioned states. “On Tuesday, 9th of January, I had a long session with Governor Samuel Ortom of Benue State during which I informed him of police arrest of some suspects with Kalashnikovs. In addition, I told him that I have instructed IGP to speed up trial and prosecution of the suspects and give wide publicity of the police efforts. “At the request of the Governor, a meeting was held in the Presidential Villa on 15th January with a wide cross-section of Benue personages where frank and open discussions were held and everybody in the meeting appreciated the complexity and difficulties of this farmers-herders strife. I assured all and sundry of my commitment to ensure that justice is expeditiously done. “To infer therefore that nothing has been done is incorrect. The police are strenuously working to apprehend the rest of the culprits of these heartless killings. “Furthermore, I have instructed the IGP to relocate to Benue State and redeploy forces to the most sensitive towns. “The Federal Government is initiating measures to address these and other security challenges, alleviate the consequence of these attacks and forestall reoccurrence. The Senate resolution itemised in your letter would be taken into consideration and I am instructing all relevant MDAs to factor them in their work.